Catherine Gallagher. 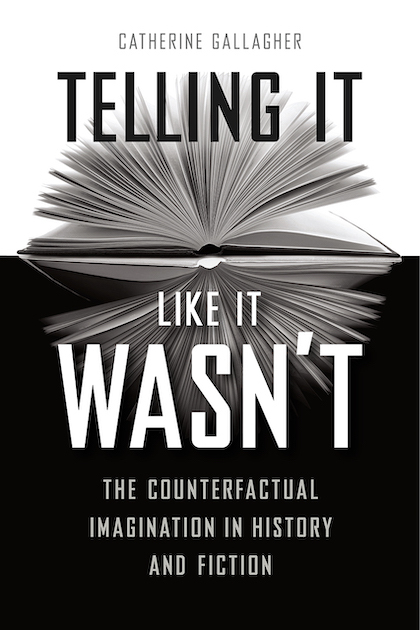 Telling It Like It Wasn’t: The Counterfactual Imagination in History and Fiction. Chicago: The University of Chicago Press, 2018. 416 pp. History being a well-defined succession of events and states of affairs, humans often assume that it is supervised, if not even determined, by a higher authority: Fate in Ancient Greek mythology, God in Biblical theology, or the World Spirit in Hegel’s philosophy. Alternatively, one can contend that the actual cause of historical situations is a mix of human actions and contingency. The battle of Waterloo (1815) brought an end to the conflict between Napoleon Bonaparte’s military ambitions and the pan-European alliance against him. Was this battle’s outcome a sign of God’s intervention in human affairs or a stage in the progress of the World Spirit? The defeat of the French army might have been avoided in the presence of different contingent factors—say, a delay in the arrival of the Prussian forces; or of psychological ones if, for instance, Napoleon had listened to the advice of his general who (having already been defeated by Wellington in Spain) warned the French emperor not to go into battle. Similarly, were the victory of the Union army at Gettysburg in 1863 and the defeat of the Third Reich and its allies in World War II triggered by providential decisions, or were they rather the product of the usual mixture of competence and chance? If chance is the answer, one might argue that because history aims at studying human rather than providential factors, it should look beyond what actually happened and take into account possible counterfactual results of these conflicts. What if Napoleon had been victorious at Waterloo or the Confederate army at Gettysburg? What if the Third Reich had won the Battle of Britain? Counterfactual history imagines different pasts and thus brings to light concrete aspects of that hypothetical world that have shaped our actual present. As John H. Elliot argued in his Empires of the Atlantic World: Britain and Spain, 1492–1830 (2006), if Henry VII of England rather than Isabella I of Castile and Ferdinand II of Aragon had financed Columbus, and if under Henry VIII a European army rather than a Spanish one had conquered Mexico, then a wealthy, bureaucratic imperial England might have developed. Because a rich, prosperous Henry VIII would not have needed to confiscate monastic properties, he might not have forced his country to convert to Protestantism; on the opposite side, Charles V of Habsburg would not have paid so much attention to Spain—in this scenario a poor country—and might have allowed the Protestants to prosper there. Economic factors rather than merely psychological ones become thus visible. The kind of alternative situations that might have happened but did not are often the object of literary fiction, as Catherine Gallagher shows in her impressive study of counterfactual fiction. Her book aptly begins with a survey of eighteenth-century military theory based on the fact that military clashes, the quickest decisive factors in history, can be won and lost for a variety of barely visible reasons. Gallagher shows how in the eighteenth century, military historians like Henry Lloyd for the first time described battles in great detail while game specialists like Giacomo Opiz developed war games that tested the strategic and tactical abilities of the players—adding dice to represent chance. Soon, the French invention of the mass war and its memorable use by Napoleon encouraged military historians and theoreticians to develop a new, systematic reflection of war, exemplified by Carl von Clausewitz’s On War (1832) and A. H. de Jomini’s Art of War (1836). Both authors argued that war is partly ruled by chance, Clausewitz by emphasizing the unpredictability of its outcome and Jomini by using counterfactual arguments. Next, Catherine Gallagher examines several nineteenth-century French alternate histories that imagine how the world would have evolved if Napoleon had continued his military conquests (Louis Geoffroy-Château), or if, on a more grandiose historical scale, the interaction between religion and the state had been different (Charles Renouvier); and, again locally, what kind of world might not have suppressed the 1870 Paris Commune (Auguste Blanqui). In Geoffroy-Château’s Napoleon and the Conquest of the World (1836), the speculations are so implausible that the author presents them, in Gallagher terms, as “a full-fledged fiction with a counterfactual premise” (p. 53). Probably influenced by Edward Gibbon’s Decline and Fall of the Roman Empire (1776–1789), Renouvier imagines how much better the whole history of Europe would have been if the Roman emperor Marcus Aurelius and his rival Avidius Cassius had, instead of fighting each other, worked together to get rid of Christianity, which Renouvier’s Uchronia presents as “one of the most fanatical and intolerant of the Oriental sects” (p. 59). As for Blanqui, a French socialist leader who spent most of his life in prison for sedition, his Eternity through the Stars (1872) argues based on contemporaneous science that there must be a multiplicity of worlds similar to ours, each taking a different historical path. An early, funny satirical novel using alternate-history is P’s Correspondence (1845) by Nathaniel Hawthorne, in which Napoleon, kept in a London prison, shakes in fear as Lord Byron and Percy Bysse Shelley turn conservative; the implication being, as Gallagher points out, that Napoleon was not as brave as he appeared and that Byron and Shelley would not have continued to produce great poetry if they had lived longer lives. By the end of the century, less eminent authors would write the first actual English and American alternate-history novels: It May Happen Yet: A Tale of Bonaparte’s Invasion of England (1899) by Edmund Lawrence and Hallie Marshall (1899) by Frank Williams, both employing counterfactual themes that would become and remain popular: the imaginary defeat of England in 1815 or 1940 and the equally nonfactual victory of the Confederacy in 1863. As Gallagher explains, these two rather weak novels were later followed by a multitude of detailed, successful narratives about the imaginary future of a Confederacy that advanced alone towards better racial relations and an England that kept its dignity despite occupation by Napoleon’s or Adolf Hitler’s armies. Gallagher’s long, lucid analyses of twentieth- and twenty-first-century American and British novels shed new light on this genre, showing how it slowly moves from an analysis of the main actors’ personalities to a wider evaluation of the way entire cultures and communities behave in difficult situations. Why does fiction need to invent alternate histories? Because, Gallagher convincingly answers, historical determinism is a speculative misconception and people want either to imagine past situations in which their own moral and political options triumphed or, on the contrary, to show that in the end these options would have won even if they had been temporarily defeated. This learned book, written in a clear, friendly style, invites the reader to realize that alternate-history fiction encourages a key human insight: the world in which we live is not the only possible or actual reality; something else is out there, waiting for imagination to discover it. These kinds of novels might therefore alleviate nostalgia, clarify past social interactions, cure or moderate collective pride, and—as fiction often does—help us reflect on human greatness and misery. Gallagher’s book made the present reviewer wonder whether other, less visible historical alternatives might have been the topic of fiction. For instance, concerning American history, suppose that when the future founding fathers wrote to George III explaining in the nicest terms that Parliament’s attempt to tax the colonies was an abuse of power, the sick king had been in a lucid, healthy state of mind. He might have realized that the Americans were right, and perhaps he might have sided with them. If, as a consequence, the American colonies would not have declared independence, slavery in the South might have been abolished in 1834 when the Crown ended it in the whole Empire (reimbursing the owners with the full value of their freed slaves). Would the Southern colonies have accepted the abolition of slavery at that point? Concerning the twentieth-century European world wars, what if in 1916 France and England had accepted the Austro-Hungarian attempt to end the war, inviting all fighting powers to negotiate a peace treaty? Imagine that Robert Musil had a much younger cousin, a fervent admirer of Robert Louis Stevenson and Johann Strauss (the elder). In 1944 this cousin would have written a novel entitled From Danube to the Potomac narrating the life of an adventurous Austro-Czech couple who—in happy, peaceful 1942—were appointed as consul and ceremony supervisor at the Austria-Hungary embassy in Washington. Might this alternate form of the destructive years between 1916 and 1945 have been in any way possible? Regarding Napoleon, Gallagher rightly notices that, with the exception of Hawthorne, his personality was usually imagined either as either heroic or demonic. In his essay The Spirit of Conquest and Usurpation (1814), the great French liberal thinker Benjamin Constant noticed that leaders whose position is not fully legitimate according to the laws and traditions of the country they govern periodically tend to make spectacular military and political decisions in order to remind the population that they truly deserve to lead the nation. Napoleon’s urge to conquer was in Constant’s view a way to claim that his brutal, illegitimate rise to power offered France the immensely beneficial chance of becoming the most influential country in Europe and, perhaps, in the world. Highly risky and in the end harmful moves, like the invasion of Russia in 1812, were meant to remind the French how lucky they were to have such a heroic, invincible emperor. Similarly, Hitler’s incoherent military decisions (let’s invade the UK, let’s not; let’s make peace with the Soviet Union, let’s conquer the Soviet Union; let’s support Japan—by declaring war on the United States; let’s resist at Berlin until the very last minute) may well reveal that this failed painter promoted by dubious political moves to the position of dictator for life needed to prove the importance of his racially providential mission by constantly making unexpected, irrational decisions. To conclude, Catherine Gallagher’s important book is a rich source of knowledge, of psychological and sociological insights and—as one gradually realizes while reading it—of a fresh, surprising way of looking at both history and fiction.